The Times wasn’t too impressed by Marianne Faithfull‘s set at Town Hall on September 24th, though they did have good things to say about Marc Ribot, who once again backed her on guitar. Despite a good band (most of the crew from the new record, directed by the bassist Greg Cohen and including the guitarist Marc Ribot, who repeatedly tore it up), despite the rousing volume, despite the healthy and unhealthy adulation from the crowd, much of the show felt a bit inert. Having finished her part in a song, Ms. Faithfull leaned against a stool or a keyboard or a speaker, smiling into the distance, waiting for the musicians to wrap it up. 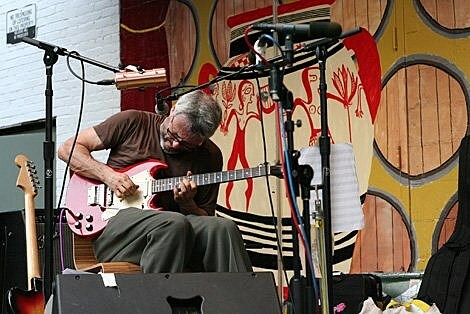 Ribot plays tonight (9/29) with Ceramic Dog, a trio with Shahzad Ismaily on bass/moog/other and drummer Ches Smith, and regular guest Eszter Balint. Tickets are still on sale. Marc will be back at the venue on November 18th for a show with Akiko Yano. He played guitar on her 2008 T-Bone Burnett-produced album akiko, and it’ll be their first NYC show together. Tickets are on sale. She plays without Marc Ribot (but with Will Lee & Chris Parker) at Joe’s Pub on October 6th (tix).